Orlando nightclub shooting on June 12, 2016. Those who lost their loved ones in one of the biggest gun related massacres in U.S. history wear this t-shirt so that everyone who sees it never forgets. 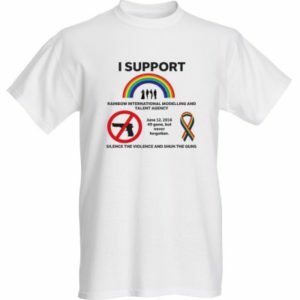 This is one of a number of items for the LBGTQ product line. A consistent conversation ultimately leads to results. Visit the main Facebook page: www.facebook.com/silencetheviolenceandshuntheguns/ or the Canadian Facebook page: www.facebook.com/silencetheviolenceandshunthegunscanada/ to see the entire line of items. Buy here!